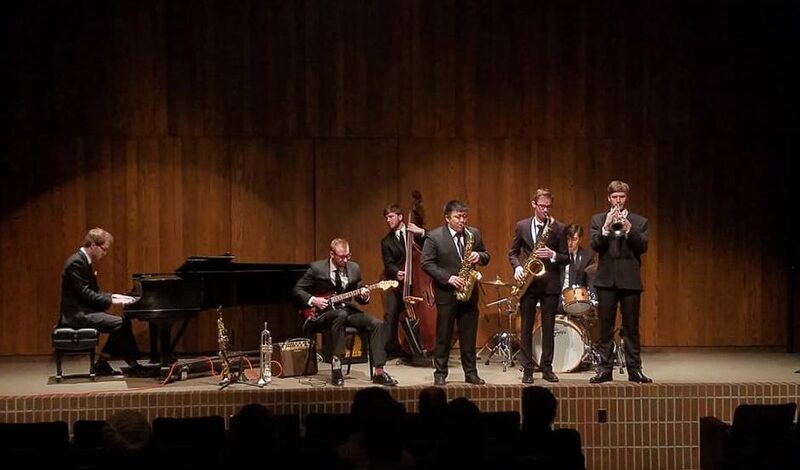 The Gustavus Jazztet performs at the 2018 Eau Claire Jazz Festival. The festival is one of the oldest and largest regional festivals in the area and the Gustavus Jazz Ensemble placed third in the Collegiate Big Band category. Several Gusties were also recognized for outstanding musicianship including: Lydia Kalenze ’21, Caleb Gampson ’21, Emma Silber ’19, Andrew Peterson ’20, Matthew Pham ’19, Matt Guilette ’20, Kevin Treb ’18, and Maripaz Alvarez Tostado Gonzalez Mendez ’19. All three of the Gustavus ensembles received feedback from acclaimed jazz artists, attended clinics by festival headliners Bob Mintzer and Bobby Sanabria, and attended the concerts of other collegiate jazz ensembles and professional groups. During their visit at Apple Valley High School, Gustavus students performed for high school musicians and Director of Jazz Studies Dave Stamps led the high school jazz band in a rehearsal.